Visit our newly remodeled Polish Cultural Center for the Annual Polish Fall Bazaar! Join us for Bazaar – two days of delicious food, shopping and entertainment! Downstairs you will find delicious dinners of pickle soup, borscht, pierogi, Polish sausage, cabbage Rolls and Polish beer – served all day. Delectable pastries as well as coffee & tea are at the dessert booths. Take-home dinners and sweets available. Upstairs features an excellent selection of amber, books, crafts, Polish crystal, Boleslawiec pottery, folk décor, Christmas ornaments, wafers (oplatki) and more! Polish Women’s club organizes two annual Polish bazaars – the Fall Bazaar is on the first weekend in November, Saturday and Sunday, 12noon to 6pm, and the Spring Bazaar is on the Saturday before Palm Sunday (one week before Easter) also 12noon to 6pm. On the ground floor the visitors can order delicious Polish meals, Polish brew, and homemade desserts. The upper hall provides a wide array of Polish products, folk art and crafts. The visitors can also become acquainted with the various organizations that are associated with the PHA, hear Polish melodies, admire Polish traditional folk costumes, and perhaps reconnect with a Polish tradition. The history of these bazaars’ dates back to the early 1960s. Newly arrived members of the Polish Community found the historic Dom Polski (Polish Home) in a bleak financial situation with little to no funds and declining membership. Out of the necessity to raise funds for the Polish Home (PH), the Koło Pań (“Ladies Auxiliary”) was created. The first meeting was held in 1962 and by the autumn of 1964 the first bazaar was organized which was an immediate success. For the first few bazaars, held in autumn, everything was handmade and donated by the members, e.g., Christmas ornaments, aprons, decorations, Polish cutouts – wycinanki. In the bare-bones kitchen of the hall members prepared wonderful traditional dishes. What wasn’t made at the PH was prepared in the kitchens of the volunteers and in donated premises such as the Brenner Brothers Bakery in Bellevue who provided the use of its facilities for baking breads and cakes which were sold at the bazaar. From the bazaar profits much needed improvements were made in the kitchen and finally most of the bazaar preparations were done in-house. As the bazaars in autumn became more and more popular, a Spring Bazaar was added to the annual schedule. Both bazaars featured not only products of local artists but also those from Poland like amber and regional folk crafts. From those days in the ‘60s through today, the profit from the bazaars has been spent primarily for financing improvements to the building. In addition, Koło Pań allocates funds for philanthropic causes – assisting not only local Polish organizations but also local charitable organizations such as the Salvation Army, Emergency Shelters for Women, Red Cross, etc. Within the Polish community the Koło Pań has assisted many causes and organizations: assisting the Polish school and scouts; awarding the best student of Polish at University of Washington; contributing to the Polish Studies at the University of Washington as well as helping a few orphanages in Poland. For 20 years it has supported the Seattle Polish Film Festival organized by Seattle Gdynia Sister City Association. In the past the Koło Pań provided financial aid as needed to families of imprisoned Solidarity activists and donated to the Polish Museum in Rapperswil, Switzerland. Besides the bazaars the Koło Pań has undertaken other activities. In 1983 the first cook book “Cooking with a Polish Touch” was published. In 1991 by popular demand the second expanded edition was published, followed by a third edition in 2005. 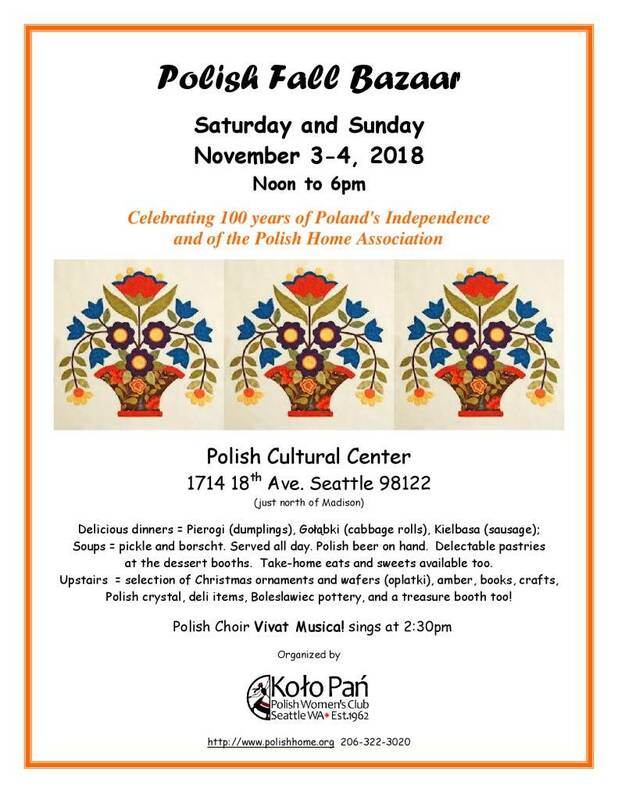 It has subsidized many events throughout the years, i.e., Opłatek, Święconka, Pierogi Fest and since 2012 the Polish Festival at the Seattle Center. With the Koło Pań’s initial funding the Sybiracy Project, with the film “A Trip to Nowhere”, became a reality. The project shed light on the tragic history of those who survived the Gulag including several members of Koło Pań and the Polish Community in the Seattle area. *The name of “Ladies Auxiliary” was changed to “Polish Women’s Club” on February 5, 2016. Visit Fall Bazaar, eat pierogi and support our cause – our next project is to remodel restaurant.